RAV PUSH & DRINK is a packaging machine for extemporary caps typical of the nutriceutical and food industry (supplements and vitamins) with powder or liquid filling, to be then assembled on bottles filled with other liquid product. 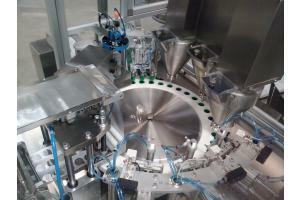 The RAV PUSH & DRINK is a packaging machine for extemporary caps typical of the nutriceutical and food industry (supplements and vitamins) with powder or liquid filling, to be then assembled on bottles filled with other liquid product. System for unscrambling and feeding from bulk containers through soundproof vibrating orienters with n. 3 tracks complete with elevator for approx. 20-25 minutes autonomy. • Safety alarms, motors, etc.